� Reports on the first calves are in and the �Consensus� is that they are the Cowman�s kind! They are the favorite sire group of all the cowmen you talk to. Birth weights are moderate, they get up and go to work and look like they have a tremendous amount of power and performance in them! � Consensus 7229 was the talk of the industry when he was selected as the $210,000 all-time high selling bull in the history of the Connealy Angus Ranch program. � Consensus 7229, the popular outcross and multi-trait sire, recorded a birth weight of 71 lbs. to ratio 97, an adjusted weaning weight of 817 lbs. to ratio 114 and an adjusted yearling weight of 1,420 lbs. to ratio 116, while posting an IMF score of 6.03 to ratio 134 and a REA measurement of 14.0 to ratio 104. � The powerful dam of Consensus 7229 blends the Pathfinder Sire, Admiral 77K and Timeline with a Pathfinder third dam. 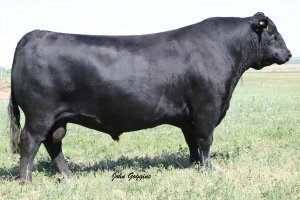 The dam of Lot 1 posts a WR 2@108 and a YR 1@116.